Neck pain is one of the commonest symptoms that Osteopaths treat. Neck pain can be caused by many things which is why it is Important to visit your Osteopath to get an accurate diagnosis. Often neck pain develops over time from the stresses and strains of everyday life. Eventually, the parts of the cervical spine, or neck, begin to wear out. The neck or cervical spine is formed by seven vertebrae, C1 to C7. The top vertebra (C1) connects to the bottom edge of the skull. 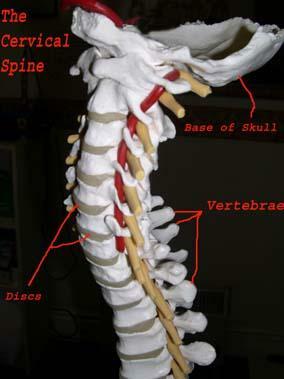 The C7 vertebrae sits on top of the thoracic spine of the chest. The nerves which go into the arms pass between the vertebral bones of the neck and the vertebrae are separated by the discs which cushion the neck bones. A disc is like a bag of toothpaste surrounded by tough elastic band like structures. There are two facet joints between each pair of vertebrae, one on each side of the spine, which help guide the movements of the neck. There are many causes of neck pain varying between minor strains to the more serious, such as such as cancer (rare) or a spinal infection. Most neck problems happen after years of wear and tear on the parts of the cervical spine. At first, these small injuries are not painful. But over time they begin to cause neck pain. Most of us will get spondylosis as a natural consequence of aging, but this is often not painful. It is only when we further damage soft tissues such as ligaments or discs that we upset this normal process. The normal aging process involves changes within the cervical discs. Over time, the nucleus in the centre of the disc dries out and the annulus, the outer bag, also weakens and develops small cracks and tears. The body tries to heal the cracks with scar tissue which is not as strong as the tissue it replaces and can easily become strained. As the disc shrinks the space between the vertebrae narrows causing excess pressure on the facet joints, which can lead to wear and arthritis. The nucleus may push through the weakened annulus and onto the nerves of the arms or spinal cord. This is called a herniated or slipped disc. Later as degeneration continues, bony spurs can develop around the joints. These bone spurs can cause problems by pressing on the nerves of the spine where they pass between the vertebrae. This pressure on the nerves causes pain, numbness, and weakness in the arms and hands. Unless you have had a severe injury to the neck, the muscles probably haven't been pulled or injured. Usually the problem may be coming from irritation or injury in other soft tissues, such as the disc or ligaments. The neck muscles may go into spasm to help support and protect the injured area. With a "Trapped Nerve" in the neck the pain often radiates into the arm and fingers. It is usual that specific fingers may hurt or have "pins and needles" sensations. The area where the pain is, corresponds to the path of the nerve and this will help your Osteopath to quickly find the area where the nerve is irritated in the neck. A nerve can be trapped by many conditions but usually it is due to wear and tear (or spondylosis), a "slipped" or herniating disc or unstable neck bones due to malformation or ligament overstretch. This is when the spinal cord itself is compressed, inside the middle of the spinal canal. Spinal stenosis may be caused by degenerative changes, such as bone spurs pushing against the spinal cord, a disc herniation that pushes against the spinal canal, ligaments inside the vertebrae stiffening and pressing on the spinal cord or a congenital malformation of the neck bones. Although neck pain can be serious, the vast majority of injuries are not and can easily be helped by your Osteopath. He should normally be able to reduce your symptoms to a pain-free level and give you advice and exercise to help prevent future problems.